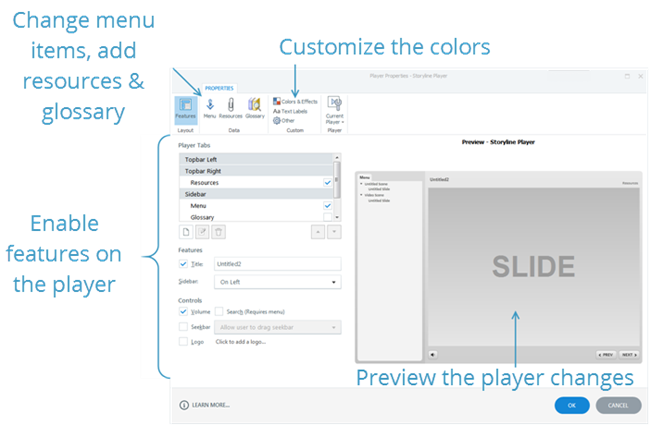 Articulate Storyline 2 gives you many ways to customize how learners experience your courses. One way is to customize the player, which is the interface that appears around the perimeter of your slides. Another is to publish your course so learners can view it on a variety of devices. Your course player can include things such as a clickable menu, a seekbar, slide notes, a glossary, a button for supplemental course resources, and player controls such as forward and back buttons. Articulate Storyline 2 makes it easy to customize the course player exactly the way you want it, so you’re never stuck with a cookie-cutter look. Storyline 2 lets you publish your course to a variety of formats, including Flash, HTML5, and the Articulate Mobile Player for Android and iPad. You’ll simply finish your course, select which formats you want, then click Publish. To practice customizing the player, you can use these practice files included here.